I have a big brand SATNAV, I have Google Navigation on my phone and I also have another brand of SATNAV on my phone. You could say that I like to know where I’m going. If I have a meeting to get to or if a new independent coffee house has opened up, I’ll just tap in the post code and we’re off. There is no planning, no thought about if it is the right way. I hand over all responsibility to the arrows and colourful maps on the 5 inch screen above my dashboard. Oh, how blissful. How nice to drive along the road for 3 hours, until you arrive at your destination and realise that something doesn’t look quite right. You were aiming for the city centre, but instead you are surrounded by fields and there is a farmer heading towards you with a telescope… wait a second, (as you lean over the steering wheel to get a better view)….actually that’s a shotgun. Reverse, reverse! 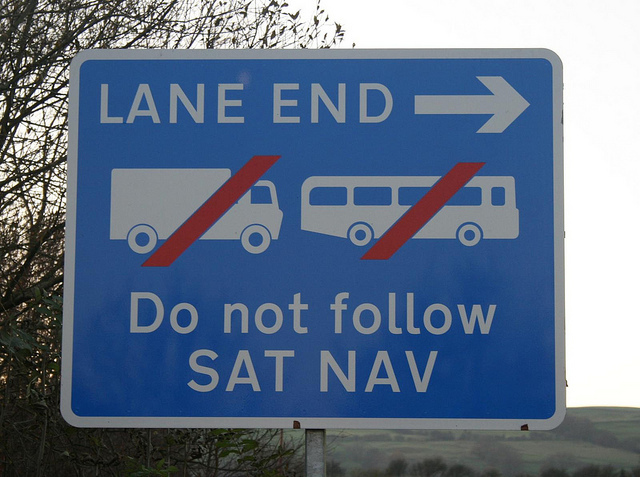 Do you ever get the feeling that SATNAV’s are colluding, they’re scheming against you? In a faith-filled life we need to use our imagination rather than depend on spiritual SATNAV’s. If you are a person who believes that God has a distinct and unique plan for your life, it is easy to wait for turn by turn instructions. We can hang back and only move forward when we hear the “audible voice” giving us the next checkpoint. Where is the imagination in that? If we are created in the likeness of God, and this same God created the earth in all its splendour; then surely we should be able to engage a little imagination. If God does have a plan for our lives, I see it more of a map and not a SATNAV. With a map, getting to your destination could mean taking any number of routes. Looking down at a map you will notice how roads can criss-cross in places and wind through the more scenic parts of our world. With a map we are back in the game. We do not blindly follow step by step instructions along a direct route. We get to experience the beauty, the artistry and challenges that are stationed along the route. We have some of the responsibility back with us to ensure that we reach our destination. The unique, colourful plan for your life needs you to join in with God. The route is not set. It is a cooperative, not a dictatorship.